One of my daughters lives in the City Point neighborhood of New Haven, Connecticut, which is in southern New England on the shore of Long Island Sound. There is a very large population of feral cats there. Winter and summer, they live outside and avoid all types of city traffic in this oasis of quiet and calm. 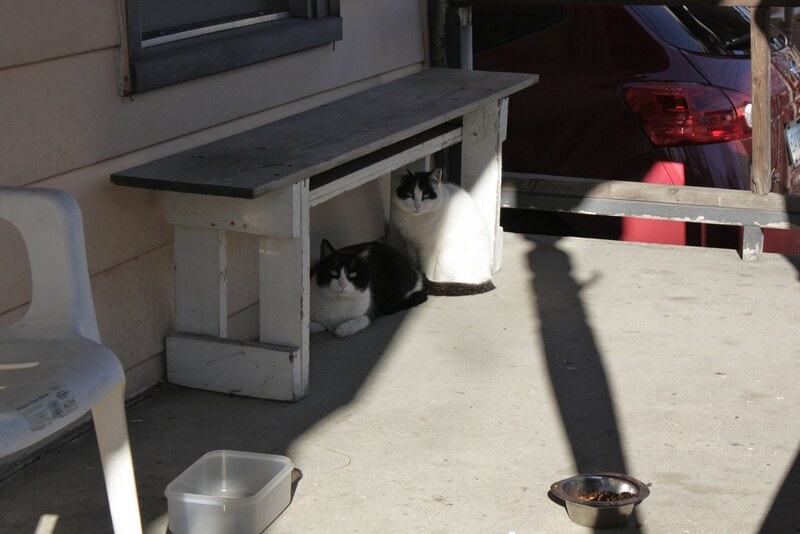 The City Point residents all help the cats with food and shelter. Since they are feral, the cats won't move in with families. But other shelter is provided. A neighbor has built a dog house type structure on his front porch. It has bunk beds, heat and a sky light. Food is provided. During the winter nights, this feral cat shelter is always full. And the cats even share the shelter with possums! My daughter told me I couldn't photograph it because it was on private property. In my photo above are two cats that wait for Anna to feed them on her front porch. To view more of City Point's feral cats, go to my post from 2007. That's so nice of the people to help feral cats. The two on your picture don't look feral at all rather very well fed ! In Brussels we have ferals too and mostly elderly people feed them and young vet students catch them to spay them and then they are released again. Glad that help is given to feral cats. I think it is wonderful that people are providing shelter and food. I wish more neighborhoods would do the same. We all need to do what we can to help feral cats. The shelter sounds amazing! I wish you could photograph it. How wonderful that someone built this. I looked at you other post as well. That seems like a lot of cats--but all appear cared for. What wonderful peeps!!!!!!! We hope they will be mightily blessed for what they do. Glad to hear the neighborhood is caring for the cats - hope they are getting neutered too! I had a friend in Brooklyn who fed 100s of feral cats and captured them to take to the Vet when needed. Unfortunately, she died--poor cats. How wonderful about the people who help the precious feral kitties.